Protect your family, property and environment from wildfire. Home/Fire/Protect your family, property and environment from wildfire. Every year we see raging hot fires tragically destroy entire towns and claim lives. This doesn’t have to happen. Did you know that most of the huge wildfires which destroy homes and forests can be prevented with a bit of hard work and community spirit? Each year dry grass and weedy shrubs thicken the fuel load on the forest floor. When country is not fire managed correctly, this build up becomes a time bomb, which can cause a wildfire that could travel over thousands of hectares of country. It’s a fact that wildfires are one of the biggest reasons for extinction of our native plants and animals. Wildfires release huge amounts of carbon into the air; they are a major contributor to global warming. As temperatures rise the threat of wildfire intensifies, creating a deadly spiral effect. We don’t have to sit back and watch the world decline. We can do something about it! Every Australian should be aware of this knowledge. 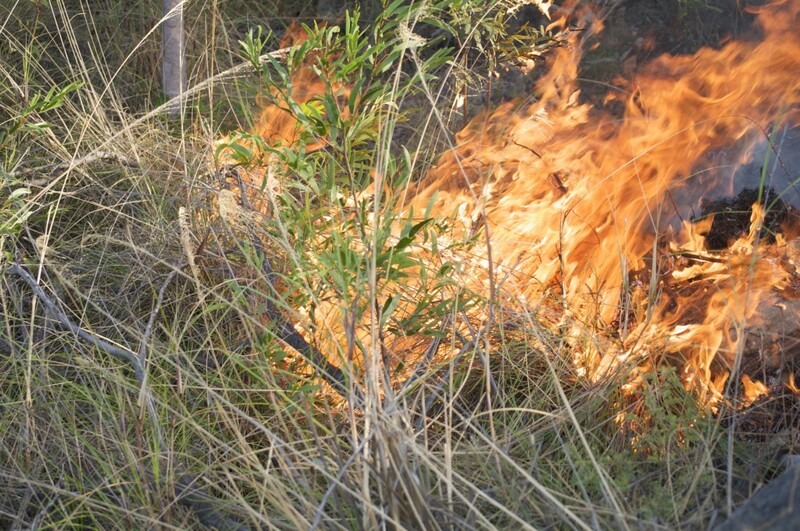 In the old days, Aboriginal people managed the land by using fire to keep country healthy; this prevented wildfires from destroying plants and animals which were the vital source of their existence. Now that this traditional practice has stopped in most places, we are facing an era of total fire disaster. These preventable natural disasters have become a massive threat to every living species in our country. If we are going to successfully deal with climate change, we need to adapt and make our country healthy through fire. Traditional fire practice is the answer to preparing our land and our communities for climate change. We need to protect our trees, plants and animals to give them and us the best chance of survival. We need more trees to create more shade, provide more clean oxygen, and to feed animals. Signs of the changing world tell us we need to restrengthen and adapt Australia’s traditional fire culture to ensure a safe future for our country. How does traditional fire practice work? There is a natural balance maintained by fire. Fire planning is man’s place in the environmental cycle. When traditional fire is applied properly, there is no damage to the land or the trees. Instead, animals come from all around to feed on sweet fresh grass that grows soon after, and trees remain healthy and green to house the birds who live in their canopies. Native plants return and flourish while weeds and pests are naturally decreased. The ecosystem becomes balanced, beautiful and most importantly – a safe place to live for all. When fire is applied wrongly, it’s obvious. The result is a field of black charred trees where nothing lives. With no canopy, there is no home for the birds, no shade to protect the plants and wildlife on the ground. It takes a long time to regenerate the ecosystem – and there’s no need for this ugly tragedy. This is why you need to have an experienced trained traditional fire practitioner to lead the burning. What to expect from a good fire practitioner. A trained traditional fire practitioner understands the types of trees and soils in an area, the types of animals and their living habitats, the right seasons to burn, when and how the fire will work with the sun and the wind on any given day. A worthy fire practitioner is able to describe exactly how a fire will move before it happens – not after. A good fire practitioner’s job is to protect and nurture a healthy and sustainable ecosystem. They can tell you how the fire will benefit any given ecosystem and give an accurate estimate of how long it will take to regenerate. Some types of land need yearly burning to stay clear and safe, while other types of land need only intermittent fire maintenance. Traditional fire planning is also an effective way of controlling and preventing noxious weeds and pests, and a natural method of land regeneration – restoring a damaged or exploited place to a healthy state. Who can use traditional fire planning? Traditional fire planning is essential for communities and home owners who live in forest and bush areas, to protect their families and assets from wildfire. It’s valuable for farmers who want smarter and more sustainable methods of growing healthy livestock grasses, helping to combat invasive weeds while cutting back on poisons and chemical pollutants. For government and other agencies who manage the country’s landscape and environmental health, the study of traditional fire planning is crucial to avoid disasters. About traditional fire practice revival. Traditional fire planning and practice lies at the heart of Australian Aboriginal custodianship of land and culture. The discipline of expertly managing fire and the land is a fundamental responsibility. A healthy and safe natural environment is the most important factor for community wellbeing, and good fire practice is the secret to maintaining this balance. Across the country, from Cape York to Tasmania, Indigenous ranger and community groups are reviving the methods of their old people. They are successfully using traditional fire planning to manage large land areas which suffer from neglect, introduced weeds and industrial abuse. By re-implementing fire, Indigenous communities are seeing the natural country come back to life, native flora gaining strength and the birds and wildlife returning. Every year we see wildfires destroy entire towns and claim lives. Hectares of precious flora and endangered species disappear. This doesn’t have to happen. It’s time for communities to take responsibility. If your home or town is at risk of wildfire, gather your friends, neighbours, and council together to talk about traditional fire management for your area. Get your area assessed and fire plans made. Plan a safe future for your community now. 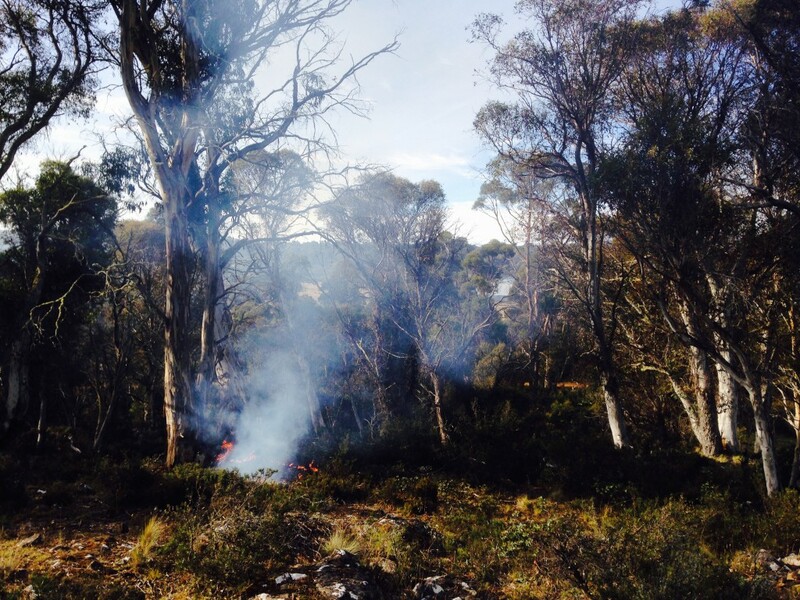 Burning the undergrowth in a Tasmanian woodland in 2015, one of the first burns implemented in decades. Long dry grasses can be volatile. Traditional burning is an effective way of managing grasslands, keeping weeds and pests down and allowing healthy grasses to flourish and feed our animals. 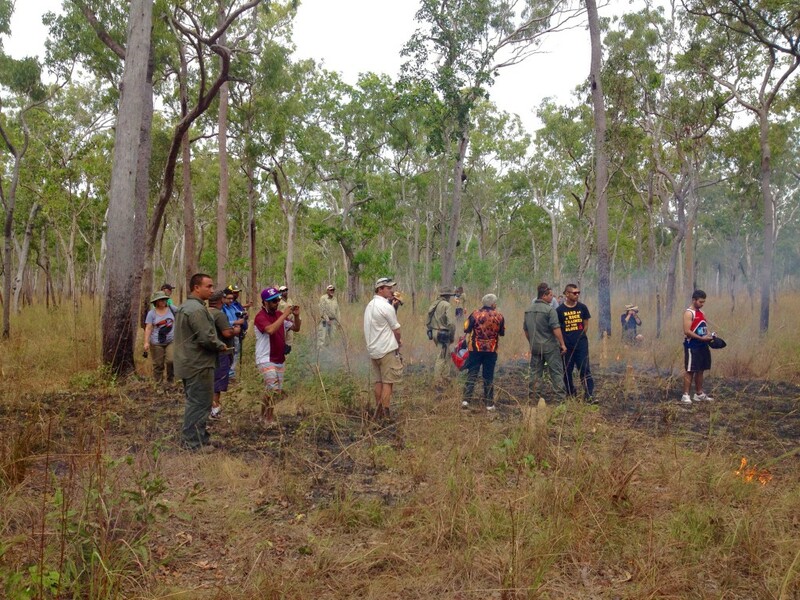 Community, rangers and rural fire services on country at a fire workshop in Cape York. Each country shows different signs of a good burn. 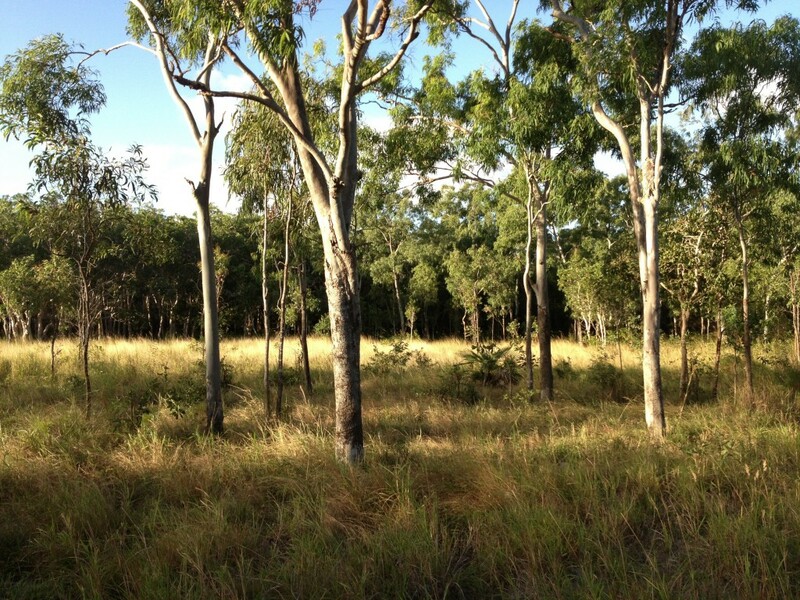 This is a Boxwood plain in Cape York, which is one of the first systems we burn. This is a good clear burn and the trees are not harmed at all. You can see in the background where the fire stopped; there’s different country there. This burn was done at the right time to bring fresh grass growth and more Boxwood trees, supporting a range of bird life, kangaroo species and other mammals. Indicators show that it’s the right time to burn this lovely gum country; the cabbage palm system on the border will require a different treatment. 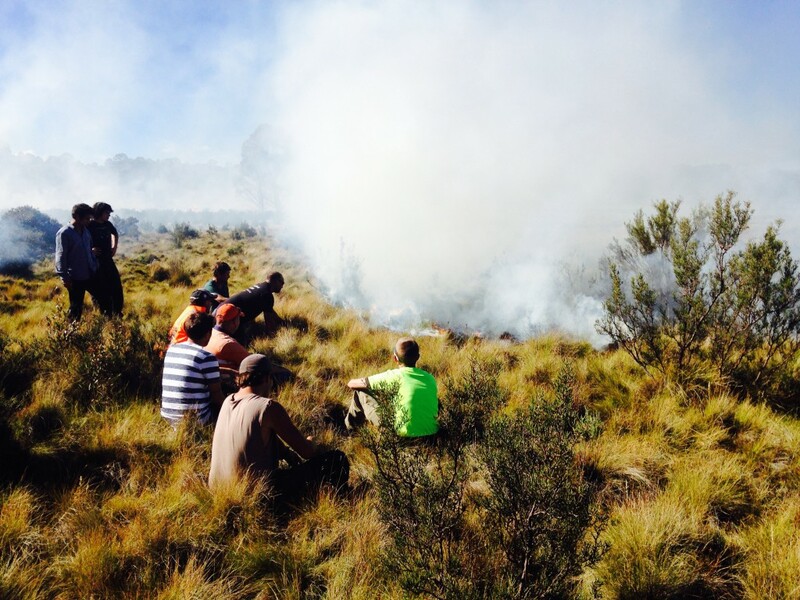 The Tasmanian Aboriginal Fire Group watch as the fire heals the country. Make traditional fire planning and safety a part of culture for all Australians. Contact us now to see how we can tailor fire safety management to your area.